The most vital element of your evaporative cooler is water, and these water control products are designed to maximize its cooling power. With accessories ranging from tubing to ﬂoats, these products are made of durable, high quality materials and feature the Aspen Snow-Cool quality guarantee. Designed to ensure a steady, adequate supply of water to your cooler, Aspen Snow-Cool water supply products are as reliable as they are convenient. These accessories make it easier than ever to keep you cool all season long! Aspen Snow-Cool water distribution products keep your cooler operating smoothly and efficiently. Distribution heads, tube restraints, and additional accessories are sure to provide you with the dependable operation you deserve. 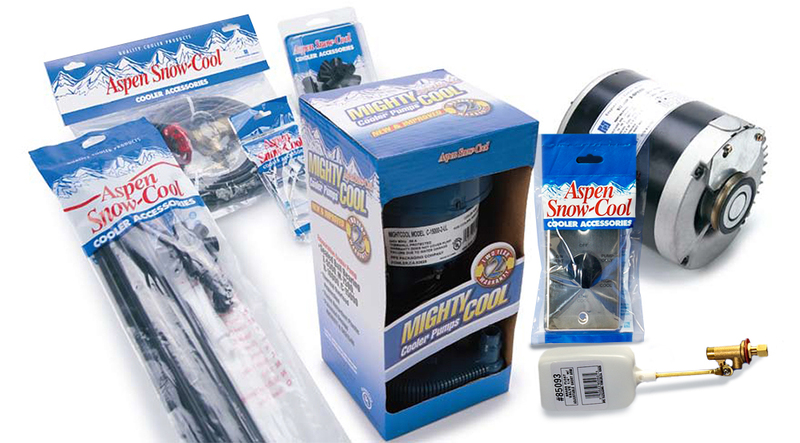 Delivering maximum quality and convenience, these Aspen Snow-Cool kits make cooler repair a snap. Choose from the Water Distribution Kit, Pump Installation Kit, Bleed-Off Kit, and Water Hookup Kit…and ﬁx your cooler with no sweat! Improving your cooler’s power supply no longer has to be a headache. Included in this Aspen Snow-Cool family of accessories are such essentials as pulleys, motors, and everything in between, ready for fast and easy installation.